Rainforest Types of Australia. Brief description of the different types of rainforest and areas where they are found in New South Wales NSW and SE Queensland QLD. National parks and nature reserves with subtropical rainforest, cool temperate, dry rainforest, littoral, lowland rainforest, and warm temperate rainforest. "cool, dry, swamp, warm ... let it rain"
Descriptions of the rainforest types found in the World Heritage Gondwana Rainforests of Australia, national parks and nature reserves of New South Wales and South East Queensland. Found mostly in Tasmania and Victoria, Cool Temperate rainforest represented in the Gondwana Rainforests of Australia, are found in small pockets at high altitude throughout the Border Ranges and Lamington National Parks. There is ready access to a grove near the picnic facilities at the Antarctic Beech Picnic Area on the Border Ranges National Park Scenic Loop Drive, and also an ancient local individual estimated to be more than 2000 years old (read the information sign to find out why), which can be viewed on a walk to "Best of All Lookout", in the Springbrook Plateau section of Springbrook National Park. Cool Temperate Rainforest is noted for its commonest and most often only dominant species, the Southern or Antarctic Beech (Nothofagus moorei), which is testament to Australia's being part of the southern supercontinent, Gondwanaland, more than 130 million years ago. Photo © Border Ranges NP cool temperate rainforest by D Palmer. Found at altitudes of 900 to 1500 metres, Cool Temperate rainforests receive between 1750mm to 3000mm of rain annually, and are often shrouded in frequent mists when it's not raining. While they mostly display 2 strata, you will sometimes find just one, with a uniform canopy of just 2 or 3 species. Stranglers and palms are absent, as is plank buttressing, but the tree trunks can be of massive size. Large vines and epiphytes will be rare or absent, although thin wiry vines and a few small ferns and orchids may occur. Ground ferns and tree ferns are very common and mossy epiphytes and lichens are in greatest abundance here. Dry rainforest is usually found on fertile eutrophic rock soils, and favours sheltered warm areas with rainfall around 600mm to 1100mm per year, marked by a dry spell. Dry Rainforest types are distinguished from Subtropical rainforest by scattered emergent species such as Hoop Pine, Teak (Flindersia australis) and Lacebark (Brachychiton discolor) trees in the upper canopy, and 10 to 30 species in the lower canopy. Buttressing and palms are uncommon or absent. Very large vines are common, and a prickly shrub layer, with species sporting delightful common names like “Wait-a-While” and “Lawyer Vine”, is usually well developed. Ground cover is limited to leaf litter and sometimes a few species of large epiphytes. The transition from various types of rainforests to eucalypt and sclerophyll forests can be quite abrupt and distinct, and in many places in all of the national parks of the Tweed (Wollumbin) Volcano, the features of dry rainforest can be discerned by keen observers. Just out of Lismore, the Wilson Nature Reserve contains the remaining recognised significant stand of dry rainforest in the region. Littoral Rainforest is similar to Subtropical Rainforest, but occurs when it is close to the sea and exposed to salt laden winds. Usually on nutrient enriched deep sands or soils derived from slates and basalts, it's considered more as a distinctive series of communities rather than a subform of rainforest. Photo © Arakwal NP littoral heathland by D Palmer. Combining the characteristics of both subtropical and dry rainforest types, it is distinguished by the prevailing wind sheared upper tree canopy, with some communities displaying prominent stands of conifers such as Hoop Pine (Araucaria cunninghamii), Plum Pine (Podocarpus elatus), and featuring species such as Tuckeroo (Cupaniopsis anacardioides). 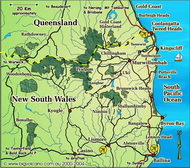 Examples still occur in isolated pockets throughout the region, including Arakwal National Park, Broken Head Nature Reserve and Tyagarah Nature Reserve near Byron Bay. To experience the largest remaining intact stand of Littoral Rainforest in New South Wales, a visit to the World Heritage listed Iluka Nature Reserve just north of Grafton is required, or you can make a day trip to Bundjalung National Park and enjoy the distinct coastal vegetation and rainforest types preserved there. The most convenient example of lowland rainforest, is on Stott's Island in the Tweed River, about half way between Murwillumbah and Tweed Heads. As the last major remnant of subtropical rainforest on a riverine floodplain in NSW, the rainforest types represented here also include palm rainforests, mangrove forests, paperbark and reed swamps. However, due to the sensitivity of the habitat and threatened species, visitor access to the island is no longer available or permitted. Bruce Chick Conservation Park, located on the Tweed Valley Way south of Cudgen Road, is located on the river bank opposite the island, and you will find parking and picnic tables for day visitors. If you would prefer to see the view from the river, take a guided cruise, or if you'd rather make your own pace, hire a dinghy or stay on a houseboat for a day or two. The only other significant stand of lowland rainforest in the region is at Moore Park Nature Reserve, just off Summerland Way. It is well known for its Grey headed flying fox colony. Three other distinctive rainforest or semi rainforest communities occur in some regions but are not generally recognised as subforms. One of these, Palm Rainforests, is dominated by Bangalow or Cabbage Palm stands, and is often found in company of Melaleuca (Ti Tree) swamp forests. Photo © Littoral rainforest and swamp forest at Pottsville, by J Palmer. Although most have been filled in for residential development, some still occur in isolated pockets throughout the region. A bisected stand of Palm and Ti Tree swamp is visible as you speed along the “Chinderah Bypass” section of the Pacific Highway just south of the Tweed River and Barney's Point Bridge. Visitors to the Tweed Heads Historic Site & Minjungbul Aboriginal Cultural Centre, Cudgen Nature Reserve at Cabarita, or the Tweed Bicentennial Environmental Park on the Coast Road at Pottsville, may see examples of mixed littoral rainforest and remnant coastal and swamp forest vegetation. Sub-tropical rainforests are generally found where the rainfall is more than 1300mm annually and growing in fertile eutrophic parent rocks (basalt and rich shales). You'll most likely find subtropical rainforest favouring sheltered gullies from sea level up to about 900 metres. There is normally a well developed multi layered canopy of between 10 and 60 species of trees, many of which will exhibit the buttressing commonly associated with rainforest trees. 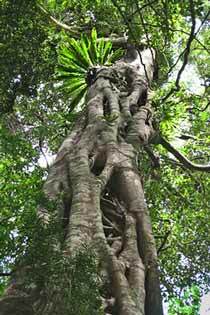 Strangler species, including the ubiquitous Strangler Fig, stands of Bangalow Palms, woody vines and large epiphytes such as Orchids, Birdsnest, Elk and Staghorn ferns will be obvious, and the ground cover will consist of ground ferns and large leafed herbs. Despite the huge diversity of species, the more common ones are Booyongs (Argyrodendron spp. ), Yellow Carrabeen (Sloanea woollsii), Rosewood (Dysoxylum fraseranum), the Fig (Ficus spp) and Lilly Pillie (Syzygium) families. In Queensland, major occurrences of sub tropical rainforest occur in Main Range National Park southwest of Bisbane, at Tamborine Mountain National Parks and Lamington National Park. In the Northern Rivers of NSW, you'll find it in the Border Ranges National Park, the lower and more sheltered reaches of Wollumbin (Mount Warning) National Park, at Minyon Falls in the Whian Whian State Conservation Area, and in the Nightcap National Park. Found on poorer soils consisting rocks such as rhyolite, trachyte and slates in the Tweed (Wollumbin) Volcano region, and on the more fertile eutrophic rocks in southern cooler regions, Warm Temperate Rainforest requires rainfall over 1300mm per year. Distinguished by a two strata layer which creates a more even canopy of trees, only 3 to 15 species will be evident, with stranglers, palms, woody vines and buttressing rare or absent. The tree trunks tend to be slender and uniform in appearance, with distinct circular shaped communities of whitish lichens covering the bark. Tree and ground ferns are frequent, and epiphytes can be common but are not generally abundant in the numbers or species present. The commonest trees are species such as Coachwood (Ceratopetalum apetalum), Sassafras (Doryphora sassafras) and Scentless Rosewood (Synoum glandulosum). Although Warm Temperate rainforest is predominant in the parks south of Coffs Harbour, examples can be found in all the World Heritage national parks of the region, between 450 to 1200 metres altitude, with major stands to be found in the Border Ranges and Wollumbin (Mount Warning) National Parks. 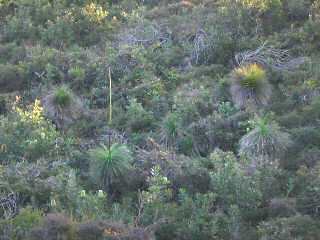 In addition to the rainforest types described above, in the Border Group parks and reserves in particular, there are also large areas of wet and dry sclerophyll forest, and pockets of sub-montane heath in a number of nature reserves with no visitor access. This provides critical habitat for a large number of threatened plant and animal species, and the region is recognised as having the highest concentration of marsupial, bird, snake and frog species in Australia, which was an important factor in the World Heritage listing. Stotts Island Nature Reserve, Draft Plan of Managment, NSW NP&WS, 2000. Under the Canopy, Guide to the Rainforests of NSW: NSW National Parks and Wildlife Service 1991. A Natural History - Tweed Gold Coast Region: BW Graham, Tweed River High School Library 1990. New South Wales Rainforests - the Nomination for the World Heritage List (revised): Dr Paul Adam, NSW National Parks and Wildlife Service 1987. Trees & Shrubs in Rainforests of New South Wales & Southern Queensland: J.B. Williams, G.J. Harden & W.J.F. Mc Donald, Botany Department of the University of New England, Arimdale NSW, 1984. National Park Guide, Richmond - Tweed brochure: NSW National Parks and Wildlife Service. Date Unkn.